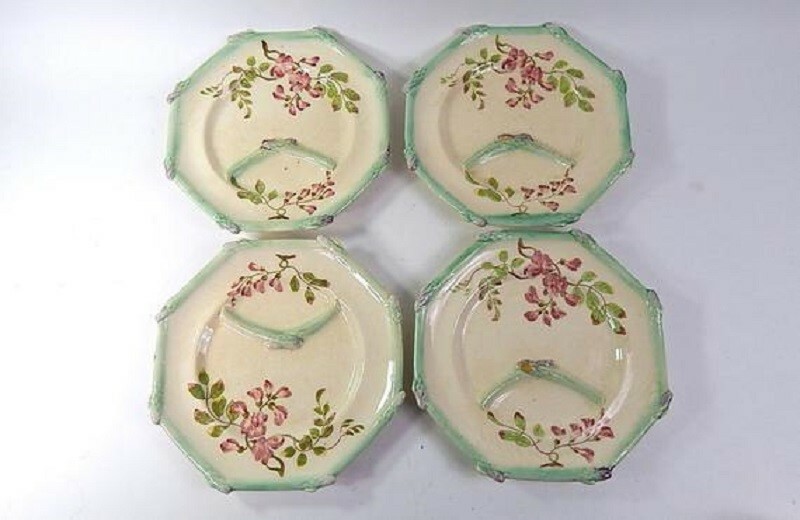 4 Majolica Antique French Asparagus Plates. These unusual and hard-to-find majolica asparagus plates with 8 sides formed by asparagus stalks were made by Longchamp as part of the 'Pompadour' series. 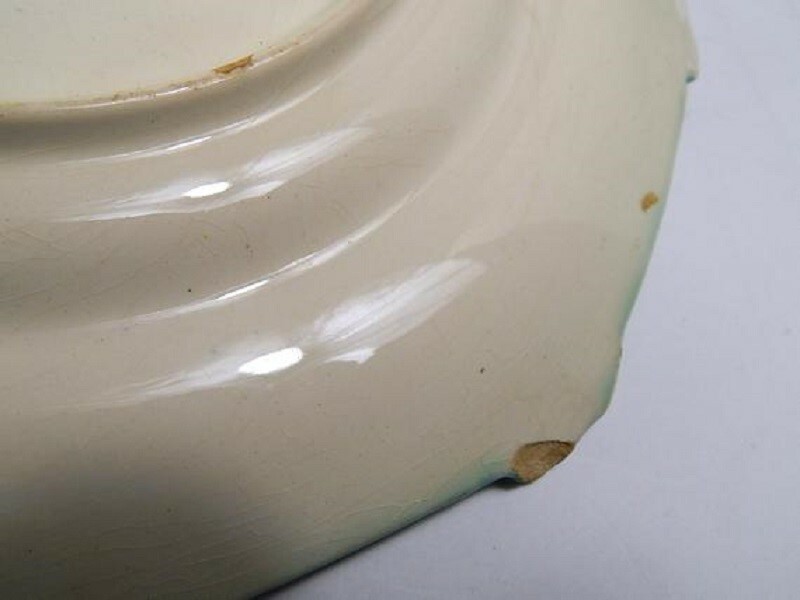 Their impressed mark is found on the back of the plates. 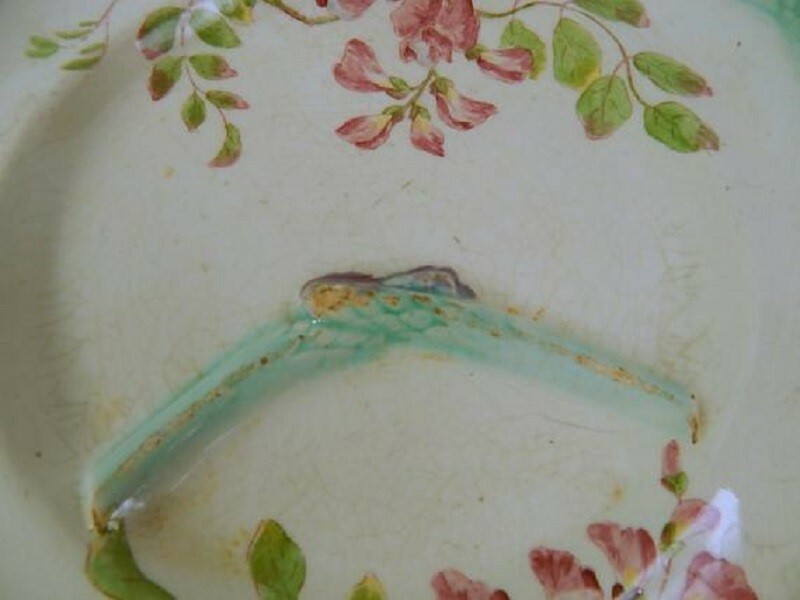 These plates with lovely floral decoration were entirely hand painted before glazing. Longchamp specialized in Majolica ('Barbotine' in French) for serving asparagus, artichokes and oysters. These plates are documented on page 62 of the definitive book by Maryse Bottero, "Artichauts et Asperges en Barbotine"
Shipping from France for this item will be £21.50 to UK and Europe. Shipment will be by French Colissimo International Airmail which includes Professional packing, insurance, a tracking number and delivery on signature for added security. For a number of years now, we have had a business selling fine French vintage and antique linens, and a selected group of other vintage and antique items worldwide and please do let us know if you have any specific requests. We have a large stock of beautiful things and we enjoy the challenge of finding just what you are looking for. To introduce ourselves, we are a husband and wife team, he's Irish and I'm American, who live in France in the charming and historic town in the South of France called Pezenas. For us it is particularly special in that there is a street filled with over 20 antique shops just blocks from our house! We travel often on weekends during the spring and summer to flea markets, 'brocantes' and antiques fairs all over the south of France, searching for the linens and the other items we sell. When at home we enjoy our family--especially our children and our 3 adorable English grandchildren-- when they can visit us, or we can visit them in England. My son comes to visit us once a year from America. While my husband does all the 'admin' work for our business, I do lots of washing and ironing of the vintage linens we sell which strangely I can say I really enjoy! I'd love to find more time to paint, knit and sew--and maybe that will happen! All in all, we love our life here in France and the work we do to bring these fine old linens and antiques to our customers around the world. Again thank you so much for visiting us...and do come back often...we are always adding 'new' old things...and we love making new friends!